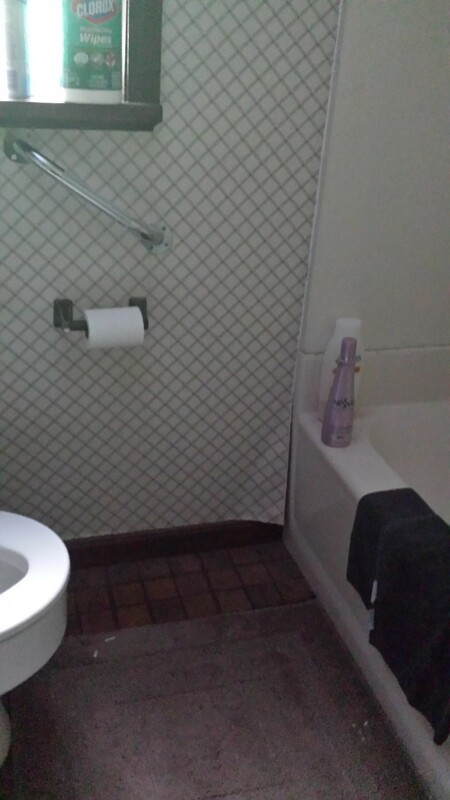 The single bathroom is a tiny space with peeling wallpaper and dark and outdated cabinetry. I have chosen to start here because it should be relatively easy to freshen this room quickly. Call it my warmup, if you will. 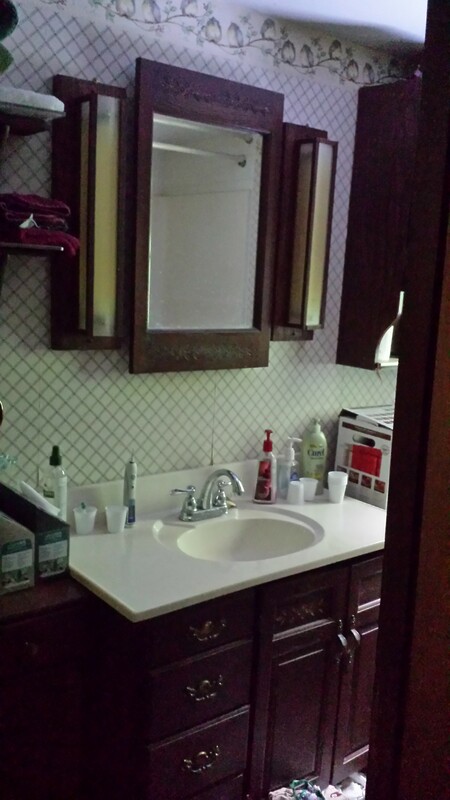 I propose to paint the flooring and cabinetry, remove some of the outdated accessories, and add new fixtures. All over the course of four weeks. Sounds pretty simple. I’ve done my homework on what is needed to paint the vinyl flooring but until I’ve removed the wall sconces, I’m not sure what I am going to be getting into electrical-wise. We’ll find out together! The products I am going to feature for this room are SafetyGirl’s tool belt, sold on our SafetyGirl, Construction Gear, and Discount Safety Gear websites; and disposable coveralls, sold on our Discount Safety Gear and Construction Gear websites. Some other stuff I will use on our site will be featured in later room blogs, but I will also be using a respirator, gloves, and safety glasses. I have purchased latex porch and patio paint, and Bullseye 1-2-3 primer. I will need to sand the floor, clean it, maybe also buy a deglosser, and definitely find a clear top coat. The paint is the palest seafoam green latex and I think it was supposed to be acrylic-based so I am unsure how it will fare. The cabinetry will be done using Rustoleum’s Cabinet Transformations in Espresso. None of these companies has compensated me, nor do I represent them. I would like brushed stainless hardware for the cabinets. The existing towel bar will need to be replaced with something more modern. I also want to strip and paint the walls. So far, I am up to about $150 in consumables. Paint brushes and rollers will round out my parts list. I can keep the existing shower curtain and liner, and tub if I give it a good scrub. I want to keep the room uncluttered so I will be removing the curtain from the frosted window. If I have budget at the end of this project I will replace either the medicine cabinet’s sconce lighting or the ceiling light/fan fixture. To interject some heart into this post so it doesn’t sound so commercial, Andy went for his annual golf weekend with the boys since I last blogged. My heart is heavy; the night before he left we had to deal with some pretty big pain from a pretty important girl. Some days are simply filled with introspection.